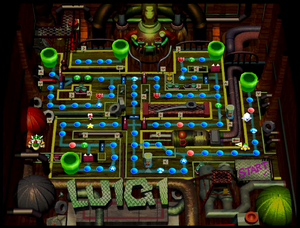 Luigi's Engine Room is Luigi's board in Mario Party. It has 3 stars of difficulty out of 3, meaning it is a difficult board. Players need to collect Stars to power up the engine in the middle of the room (but actually in the rear of the playing board). The main feature is the board-wide system of red and blue doors. One set rises up to block specific paths, while the other set goes down to open other paths. The doors switch at the start of every turn, when players land on certain Happening Spaces, or if a robot on the board called Pisudon is paid 20 coins to switch them. Happening Spaces on steam generators near the engine make steam rise up out of the respective generator, propelling players to a higher section. Players that are sent to Bowser see his "Make As Many Coins As You Want Mecha" in action. At the cost of 20 coins, players receive a free coin. No matter where the players go, all paths end in Warp Pipes that lead to Boo, who is near the start. Any time the players buy a Star, the space that Toad was on becomes a Chance Space. At the end of the game, the winner's Stars form into a large star that goes over to the engine and powers it up. It is revealed that the engine and surrounding board are located inside a wooden airship (as seen in Rainbow Ride in Super Mario 64 and later Rainbow Cruise in Super Smash Bros. Melee, Brawl, and Ultimate), with the winner standing at the front of the ship. The players in second and third place, Toad, Koopa Troopa, Boo, and the Star accompany them, while the player in fourth place stays in the engine room and is burned by the steam generators while Bowser laughs at their torture. Part of the Engine Room's map. "This is the Engine Room, but what kind of Engine Room is it? I have absolutely no idea!" "In the center of the Engine Room, there is a great, big engine. But now, it isn't moving at all." "It sure is big, that engine. I wonder what would happen if we got it going again?" "Surely, the engine isn't moving because there isn't enough energy. If only there were energy, it would move." "But what kind of energy would it take to get it moving again? Do you know?" "Energy great enough to move an engine. Probably, none other than Star Power!" This page was last edited on March 25, 2019, at 09:00.